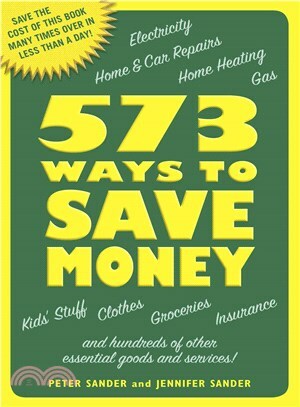 573 Ways to Save Money: Save the Cost of This Book Many Times over in Less Than a Day! Peter Sander is the author of Madoff and The 250 Personal Finance Questions Everyone Should Ask. He has an MBA, has developed more than 200 personal finance columns for MarketWatch and TheStreet.com, and has appeared on NBC Today, CNNfn, and Fox News. Peter is the author or coauthor of more than twenty books, including The Pocket Idiot’s Guide to Living on a Budget and Green Christmas. Jennifer Sander is America's Affordable Luxury Expert.? Through her books and speeches, she?reveals the many ways that a family can live well on less.? ?A?New York Times?bestselling author, she?teaches non-fiction writing in Northern?California. ?She is the author or coauthor of more than twenty books, including The Pocket Idiot’s Guide to Living on a Budget and Green Christmas.